This project posits the physiological status and nitrogen availability as the prime propellers of mutations in the nitrogen regulation pathway (NtrBC system) to restore flagella-driven motility in aflagellate strain Pseudomonas fluorescens SBW25ΔfleQ (FleQ KO). Strain SBW25ΔfleQ slid on the soft agar surface (1). 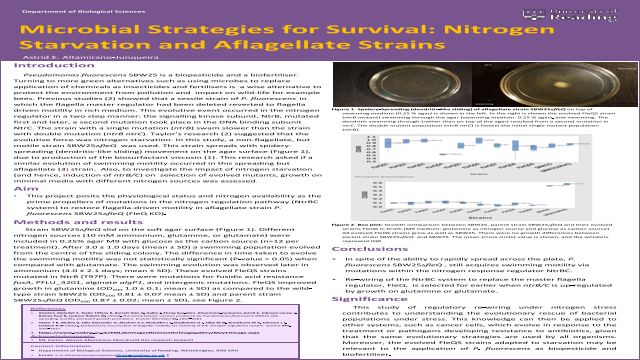 Different nitrogen treatments were done at 10 mM (ammonium, glutamine, or glutamate; n=12 per treatment) in 0.25% agar M9 using glucose as the carbon source. After 3.0 ± 1.0 days (mean ± SD) a swimming population evolved from the centre of the sliding colony. The time to evolve the swimming motility was not statistically significant different (P-value > 0.05) when compared with glutamate. The swimming evolution was observed later in ammonium (4.0 ± 2.1 days; mean ± SD). These evolved FleQS strains mutated in NtrB (T97P). There were mutations for fusidic acid resistance fusA, PFLU_4201, alginate algP1, and intergenic mutations. FleQS improved growth in glutamine (OD600 1.0 ± 0.1; mean ± SD) as compared to the wild-type strain SBW25 (OD600 0.81 ± 0.07 mean ± SD) and parent strain SBW25ΔfleQ (OD600 0.87± 0.02 mean ± SD). The re-wiring of the NtrBC system to express flagella regulon in the absence of the master flagella regulator FleQ occurs earlier when it is up-regulated by glutamine or glutamate. Studying the re-wiring of systems under selective pressure assumes significance as it helps to understand the evolutionary rescue of the population under stress. This knowledge can then be applied to other systems, such as cancer cells, which evolve in response to the treatment or pathogens developing resistance to antibiotics, given that the same evolutionary strategies are used by all organisms. Also, the evolved FleQS strains adapted to starvation can be used as biopesticides.